#111- 22 Feb 44 - To Aschersleben, Germany - Very rough flak and fighter attacks. S/Sgt William A. Ferri (Engineer) believed that he shot down a FW-190. Saw his bullets hit the FW-190. It then pulled off smoking and the Pilot made a parachute exit.. For an unexplained reason his claim wasn't confirmed. Photo flight - 23 Febuary 1944 flight over the wash to take photos of guns firing. - Captain Gamble (P), Lt Ferguson (CP) plus two other Ferguson crewmen - Lt Brown (N), S/Sgts Ferri (E) & Phillips (R) and six from other crews. Upon return it was discovered that the right landing gear could not be lowered. Eight crewmen bailed out five miles west of Molesworth. The Pilot (Gamble), CoPilot (Ferguson) & Engineer (Ferri) made an excellent one-wheel landing at Molesworth. #118 - 6 March 44 - 1st daylight bombing mission to Berlin, Germany. Hit by flak over target. Lost #3 & #4 engines. Dropped bombs. Through out ammunition, flak suits and other heavy items. Made it back to a North England emergency airfield. #164 - 29 May 1944 - To Possen, Poland. Most aircraft were low on gas. Flew across the North Sea a few hundred feet above the water. Radio Operator Robert Phillips was continually on his radio with S.O.S. messages to the Air Sea Rescue forces. Prayers were answered when an emergency landing was made at an English airfield at Forsham. 1Lt Wendell Z. Ferguson (P) - Assigned 358BS on 25 Jan 1944. 1st two missions (109, 10) as CoPilot with combat orientation Pilot Arnold Litman. 30 mission combat tour completed on 02 June 1944. 2Lt James D. Moody (CP) - Assigned 359BS on 23 Jan 1944. 1st Mission (110) with another Pilot. Did not fly with the Ferguson Crew on missions 109, 110, 114, 123, 155, 159, 161 and 164. Flew on nine missions after Lt Ferguson completed his combat tour - 8 with Lt Clifford E. Vaughn. 30 mission combat tour completed on 19 June 1944. 1Lt James F. Brown (N) - Assigned 358th BS on 25 Jan 1944. Did not fly on four Ferguson Crew missions (109, 110, 119, 120, 131). Flew on eight missions (134, 135, 170, 171, 174, 183, 184, 186) with other Pilots. 30 mission combat tour completed on 20 June 1944. 2Lt Ralph D. Schmid (B) - Assigned 358th BS on 21 Jan 1944. 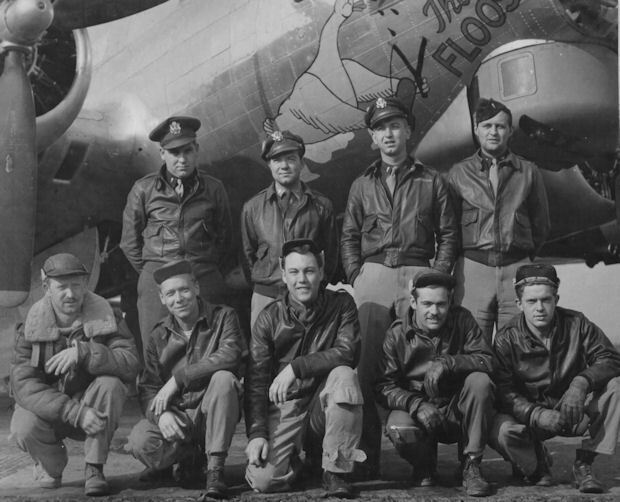 Did not fly on eight Ferguson crew missions (109, 110, 136, 137, 138, 155, 159, 164,167) where substitute Bombardiers were used. Flew on eight missions (109, 112, 113, 134, 135, 136, 137, 155) with other Pilots. 30 mission combat tour completed on 27 May 1944. T/Sgt David R. Matthews (E) - Assigned to 358th BS on 25 Jan 1944. First four missions (109, 110, 111, 114) as Right Waist Gunner. Replaced original crew Engineer, Sgt William A. Ferri on 3 March 1944. All missions flown with Lt Ferguson. Completed 30 mission combat tour on 02 June 1944. T/Sgt Robert B. Phillips (R) - Assigned to 358th BS on 25 Jan 1943. Did not fly with the Ferguson Crew on three missions (109, 110, 155). Flew with other pilots on three missions (155, 170, 171). Completed 30 mission combat tour on 5 June 1944. S/Sgt Kenneth C. Rhodes (BTG) - Assigned to 358th BS on 28 Feb 1944. Did not fly with Ferguson Crew on three missions (109, 110, 126). Flew with other Pilots on three missions (170, 171, 172) , Completed 30 mission combat tour on 6 June 1944. S/Sgt Clyde E. Smithson (LWG) - Assigned to 358th BS on 28 Feb 1944. Did not fly with Ferguson crew on seven missions (109, 110, 121, 123, 124, 137, 138). Flew with other Pilots on eight missions (109, 110, 170, 171, 172, 174, 175, 176 - five with Lt Homer P. Bailie). Completed 30 mission combat tour on 8 June 1944. S/Sgt Thomas J. Rogers (RWG) - Assigned to 358th BS on 4 Feb 1944. Did not fly with Ferguson Crew on ten missions (109, 110, 111, 114, 123, 150, 159, 161, 164, 167). Flew with other Pilots on twelve missions (87, 88, 89, 94, 100, 101, 102, 103, 104, 105, 106, 108 - nine with Lt John W. Stuermer). Completed 30 mission combat tour on 19 May 1944. S/Sgt Richard Brooks (TG) - Assigned to 358th BS on 25 Jan 1944. Did not fly with Ferguson crew on two missions (109, 110). Two mission with other Pilots (170, 171) . Completed 30 mission combat tour on 5 June 1944.